We were delighted to come across a piece by Friend of the Blog Michael Meyer (called "About That Book Advance...") in last week's New York Times Sunday Book Review section. We figured, based on the author's track record as a writer (and the insightfulness of his comments when talking about his work), that this piece would be lively and offer some illumination on an interesting topic and that it might also have some China tidbits. Well, it was not just illuminating (explaining how tough it can be for an author to live on what sounds at first like a very good advance, once the agent's cut and self-employment taxes come into play) but also entertaining (a favorite part: how in literary circles advance amounts are sometimes "coyly described like cigarette brands — the 'mid-fives,' the 'low sixes,' the 'mild sevens'"). But as for China tidbits... there were only two. We learned how much of an advance Meyer got for his book, The Last Days of Old Beijing (as in the spirit of disclosure he tells us precisely: $50,000), and even better we learned that his book will be coming out in paperback next month (take note all those in book groups, as it would work nicely in that setting). What kind of advance, you may be wondering, did we receive for China in 2008? Rather than tell you a number, let's just say it was in the "barely fours"--so barely that with just a dollar taken away, it would have been a three figure advance (albeit one of the "mighty threes"). Of course, Rowman & Littlefield basically doubled their up-front lay-out by giving each of our contributors a free copy. After reading the piece, some of us had two thoughts. First, that academics trying their hand at writing for general audiences are lucky to have day jobs to cover the bills. And, second, that it would be nice if the New York Times Sunday Book Review section editors liked Meyer's essay as much as we did, in which case they might commission a sequel, in this case demystifying the high amounts paid for translation rights. A good starting point might be that famous $100,000 reportedly offered to bring out the English language version of a certain Cry of the Wild with Chinese characteristics, boy meet wolf tale that was criticized and celebrated by different China Beat contributors last year (and incidentally inadvertently helped China Beat earn its first mention in the New York Times' excellent "Paper Cuts" book blog). 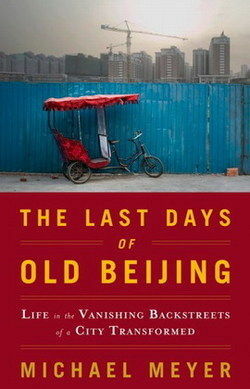 A longtime Beijing resident, Michael Meyer has, for the past two years, lived as no other Westerner – in a shared courtyard home in Beijing’s oldest neighborhood, Dazhalan, on one of its famed hutong (lanes). As Meyer describes in his book, residents' bonds are rapidly being torn by forced evictions as century-old houses and ways of life are increasingly destroyed to make way for shopping malls, the capital's first Wal-Mart, high-rise buildings, and widened streets for cars replacing bicycles. Meyer will be joined in conversation with Orville Schell, Arthur Ross Director of the Center on US-China Relations at the Asia Society. Click on the above link for more information.